Miniature roses seem modern when compared to the age of old garden roses. 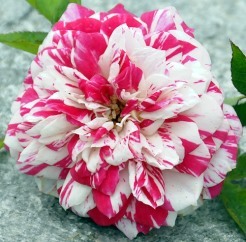 Indeed the cultivation and improvement of garden roses is thought to go back as far as 2737 B.C. 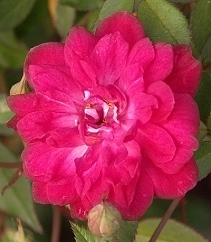 whereas miniature roses remained mostly unchanged until around the 1930s. 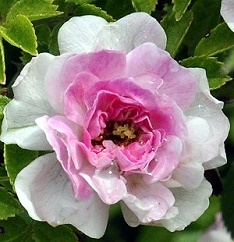 Miniature roses at that time were often referred to as "fairy roses" due to their diminutive height, leaves and flowers. While not all of our roses are miniatures, they are all unique, tough and beautiful. Many have been in the gardens here for 20 years. 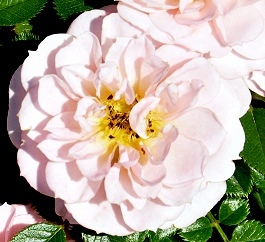 Below are some points to keep in mind when choosing and caring for your miniature roses. 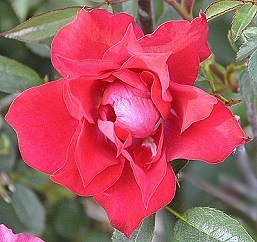 LOCATION: Consider planting miniature roses in mixed perennial borders instead of making an all-miniature rose garden. 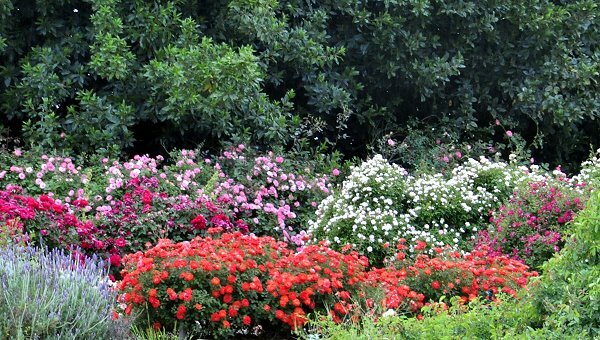 Most of the miniature roses bloom summer through fall and, with so many colors available, they blend well with most perennials. They are also great for hedging and front-of-border placement. Cinderella is particularly nice for hedging because it is thornless. 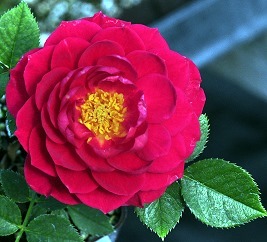 SOIL: While miniature roses are easier to grow than shrub roses, they do have many of the same needs. The soil needs to contain enough air pockets to allow water to drain freely and enough organic matter to hold the moisture so that the plants don't dry out too quickly. If water puddles where you want to plant your roses, then choose another spot. Mulching the bare ground around your roses with compost or other organic matter will, over time, help create the perfect soil. As mulch breaks down, earthworms and other beneficial bacteria take essential elements below the surface, which not only enhances the texture of the top soil layer, but also helps to correct pH and improve fertility. PLANTING: Miniature roses and the other roses we sell are on their own root stock and should be planted at the same level they are in the pot. Dig a hole just big enough to plant the rose and water well. Check often to make sure the little plant is not dry. Until it takes off into the soil around it, the original root cube needs to stay moist. This usually takes about a month depending on the time of year. Be sure to gently firm your little plant into the ground so it makes good contact with the native soil, but don't smash the soil so hard that the soil becomes overly compacted. 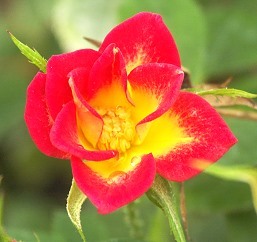 Miniature roses can also be grown in containers with coarse potting soil. Our three-inch pot should be transferred to a pot that can hold a gallon of soil the first year. Each spring, check the root ball to make sure it has not filled up the pot. The rose may need to be moved up to to a larger container. 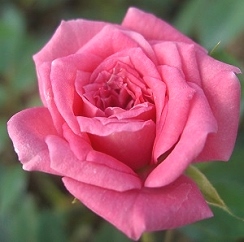 Since these roses can range from 1 to 3 feet, it is important to give them adequate root space in the container. 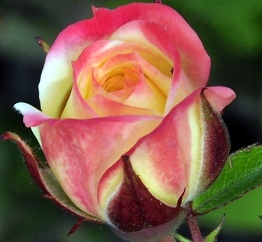 Container-grown roses will need continual fertilization with an all-purpose organic fertilizer throughout the growing season. 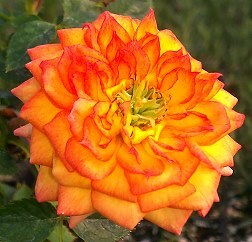 WATERING: Once planted, roses should be thoroughly watered. Always deep-soak your roses. 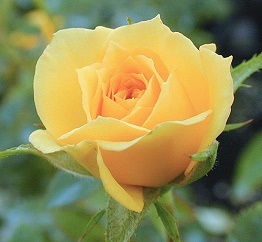 Roses have long roots that benefit from deep watering, so always water enough to penetrate below the root zone. 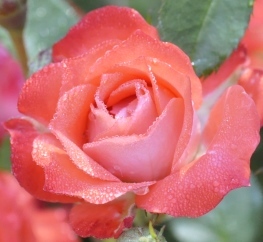 Watering on the surface encourages shallow hair-like roots that are weak and will not provide the rose with the moisture it needs to be healthy. Container-grown plants should be watered well (so water reaches all of the soil). Watering is critical the first month for the newly planted rose. It takes about that long for it to establish a relationship with the soil around it. Until that time, it can only collect water from its original root cube. Roses should never be watered so much that the ground is kept soggy. In humid areas, drip irrigation is advised to keep moisture off the leaves. Keeping the leaves dry helps to thwart fungal diseases. Watering methods that cause water to splash from the ground to the leaves can also spread fungal disease. In hot, dry areas, overhead watering is preferred for miniature roses because it keeps dust from clogging up the cells of the leaves. How often to water is an age-old question that can only be answered by each gardener. Sites, soil and conditions vary to such an extent that only on-site inspection can answer this question. A water meter can help the novice gardener to be more confident in their watering acumen. Be sure to place the meter within the root zone for an accurate reading. 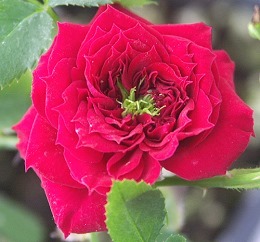 SUN: Full sun is required for growing roses successfully. 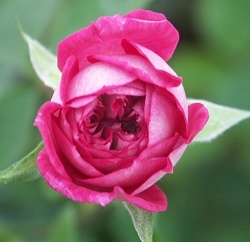 Roses that do not have full sun will be more prone to disease and may become leggy as their branches reach for light. This is often a death sentence for the rose. FERTILIZER: If compost is part of your yearly mulching schedule, then no other fertilizer should be necessary for the roses. If compost is not available, then a general all-purpose organic fertilizer should be applied in early spring. pH: The pH for roses should be between 6.5 and 7. Very acidic soil or very alkaline soil will need to be improved with the addition of lots of organic matter. Again, compost is best for regulating the soil. In extreme cases compost should be both worked into the soil before planting and added each year as a mulch in a one- to two-inch layer on top of the bare ground around the rose. Be careful not to mulch right up to the base of the rose. 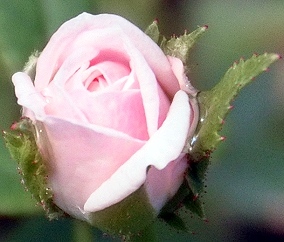 Always leave a two- to three-inch circle of clear space around the rose. 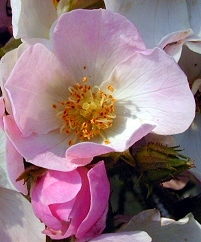 PRUNING: Pruning miniature roses is a lot easier than pruning other roses. There are no magic formulas or special cuts that have to be made. In fact, they never have to be pruned if you are happy with the way they look. We do suggest that dead canes be removed when noticed. If you want to hedge your miniature roses, late fall (in warm winter areas) or early spring (in colder winter areas) is a good time to do this. 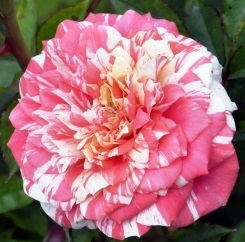 It is not necessary to deadhead miniature roses, but spent flowers may be removed at anytime. Miniature roses tend to bloom in clusters (more than one rosebud per stem) and often we will remove the entire stem after the cluster is finished. We always prune to a bud that is facing outward. This allows more light into the center of the plant as it will cause new stems to grow away from each other. If you want to harvest rose hips, then late summer flowers should be left on the plant. Rise and Shine is our favorite miniature rose for developing rose hips. 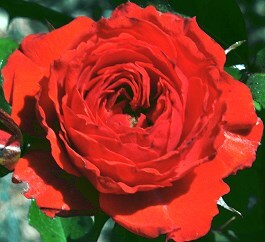 PEST AND DISEASE: Insects and disease are not as big of a problem with miniature roses as they are with garden roses. We notice aphids in the garden in early spring but a few weeks later the ladybugs come through and clean them up. Growing roses among other flowering plants will provide a diverse haven and encourage beneficial insects to take up residence in your garden. Full sun, good air circulation and proper drainage will go a long way toward discouraging diseases. 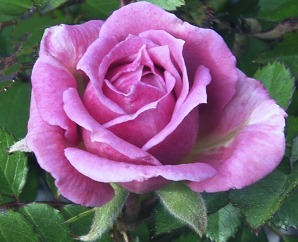 Deer, rabbits and even squirrels can also be devastating to roses in the unprotected garden. We find that miniature roses planted among other shrubs have fewer hits from these critters than those we have planted in an all miniature rose garden. To protect your roses from these large pests, you may want to install an automatic scarecrow. We have used these with great success for many years. 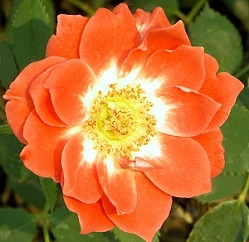 CRAFTING: Judy Fischer, Magic Carrousel, Rise and Shine are all great for harvesting perfect little rosebuds. These can be woven into fresh arrangements and allowed to dry or can be dried individually. and allowed to dry or can be dried individually. 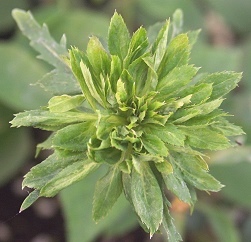 Buds should be picked just as their color starts to show and handled gently. While we let our buds dry naturally, colors are best kept when the roses are dried in silica gel. Crystal bowls full of miniature buds make attractive table decorations or placecard holders. Dried petals and leaves add bulk and color to potpourris and sachets. CULINARY USE: Rose petals have long been used in the preparation of foods. All roses can be used for culinary purposes as long as they are organically grown and clean. 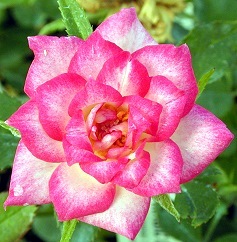 Check out "Growing Roses Organically" for more information on raising your roses without chemicals. Rose petals and fruit have an affinity for each other, thus the traditional addition of fresh rose petals to apple or fruit jelly. Petals can also be used to make an all rose petal jelly. These jellies make wonderful glazes for chicken or pork. Fresh rose petals can also be added to butters, honeys, sun teas and vinegars. Dried rose petals may be used to blend with other dried herbs for tea or cooking. 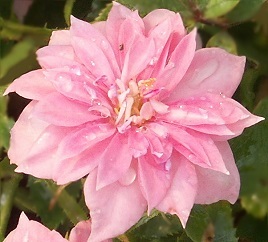 Dried petals can also be used to make rose petal syrup which can be used to flavor ice cream, pudding or drinks. Try adding a bit of rose syrup to your next martini and be sure to use a fresh petal as garnish. Check out "How to Eat a Rose" by Jim Long for more delicious ways to use roses in your recipes. All of our roses, except Petit Pink Scotch, came from the nursery of Ralph Moore, one of the most important rose breeders of the 20th century. Mr. Moore dedicated his life to the hybridization of miniature roses. We are fortunate to have known this gentle man. His nursery was not far from our own. Before we became interested in miniature roses for our company, we would visit his nursery for the pleasure of seeing all the beautiful roses. If he was there, and he almost always was, he would take us on a tour and share his knowledge and passion. Afterwards he would give us a laminated bookmark with pressed roses and a poem he had written. Needless to say, we always took roses home with us. Now that he and his nursery are but a memory, we are grateful to have his roses filling our gardens, and delighted to make them available to you. 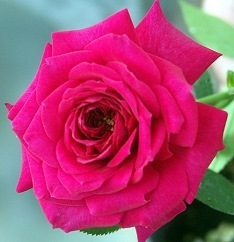 Click on Roses to view or order our wonderful rose plants. Roses make a wonderful addition to our Edible Flower Garden Six Pack. Orange Torch of Liberty Rose is to the right of Dwarf French Lavender, Red Sequoia Ruby just behind the Dwarf French Lavender, Pale Pink Cinderella is to the right of the Red Sequoia Ruby and Red Beauty Secret is to the right and in front of Cinderella, Pink Andrea Rose provides the rear backdrop. This photo was taken in mid April which makes these roses, along with Rise and Shine and Baby Austin, among the first to bloom. They are followed by My Valentine, Windy City, Why Not, Fire Princess, Sierra Sunrise, Petite Pink and Redwood Empire.